It’s been twenty seven years since the original It, which was adapted from the novel by Stephen King. Its 2017 remake, despite sharing the same title, is less of a remake and more of an 80s homage to coming-of-age movies. There are scares and creepy moments, but even while Pennywise is the scariest clown to have ever walked the planet (no one can convince me otherwise), many of the film’s actual horror pertains to the state of the youth’s psyche and less-than-stellar home life. And it’s these stories and the friendships forged amid terror that ground the film and make it much more than it is. In the small town of Derry, a young Georgie (Jackson Robert Scott) goes out to play with his paper boat in the middle of a rainstorm in October of 1988 and, upon meeting a clown named Pennywise (Bill Skarsgård), is never seen again. Slowly, but surely, kids throughout Derry begin disappearing. Bill (Jaeden Lieberher), Georgie’s older brother, is adamant that his sibling isn’t dead, but missing. 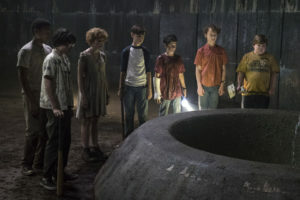 Bill and his friends (Jeremy Ray Taylor, Sophia Lillis, Finn Wolfhard, Chosen Jacobs, Jack Dylan Grazer, and Wyatt Oleff) find themselves digging deeper into the mystery of Derry and it’s not long before they come face-to-face with Pennywise himself. It is fairly psychological in that the fears of the kids are tied into their surroundings and change depending on what it is they’re scared of. Some, more than others, have more potent fears. Bill is constantly seeing Georgie, while Eddie, who is a germophobe, sees someone suffering from leprosy trying to touch him. However, the most psychologically scarring aspect of the film is Beverly’s relationship with her father. It’s heavily alluded that her father sexually assaults and rapes her and it’s enough to make your skin crawl and your nostrils flare in anger. It’s unfortunate that the only girl in the group of friends has to also suffer the worst in her home life, too; it’s sadly indicative of Hollywood’s twisted need to see a girl in pain at the hands of a man, while at the same time it’s the boys who run to protect her, all while the rest of the town calls her vile names. It isn’t as scary as it makes itself out to seem. Pennywise is at his scariest in the film’s opening, during his first appearance and exchange with Georgie. It’s then and only then that he seems real, tangible, and can be easily compared to any kidnapper, sans the face makeup. As the film goes on, the clown becomes more of a figment, a manifestation of the fear that the children feel. Pennywise preys and lures but, besides using his tactics to scare the kids with their own personal horrors, he isn’t as fascinating or as terrifying on his own merits. His tactics also play out far too often and wear down the film. An example is with the repetition of the phrase “You’ll float too.” The kids float, but what purpose does it serve? Does Pennywise feed on them by playing an endless loop of terrible images and nightmares in their minds? Does he just eat them and hope to feed on their fears in this way? Why Derry? The answers to these questions aren’t exactly answers I’m expecting, but they’re each touched upon, only for the film to take the easy way out in the end. Aside from the few scares littered throughout the film, It somehow manages to be less of a horror film and more like a film about friendship. With exception (the exception being Richie, played by Stranger Things‘ Finn Wolfhard, whose jokes and one-liners begin to grate on the nerves), the group of young friends are a solid bunch. They don’t all start off as friends, but they’re united in their need to escape and fight Pennywise. Despite the dire circumstances, they form a strong bond and their interactions and banter are enough to carry the film; it helps that the cast has a tremendous amount of chemistry. They’re also all victims of the local town bully, Henry Bowers (Nicholas Hamilton), whose violence and constant need to harm is disturbing, but not wholly necessary to the storyline. As a horror film, and the first part of a series, It doesn’t particularly stand out. There are some unbalanced storytelling moments and the third act isn’t as strong as the rest of the film. 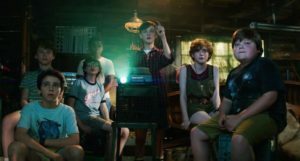 However, director Andy Muschietti does well to give the film more of a prequel feel rather than have it be a direct remake of the 1990 movie. It feels very much like an ’80s film, but isn’t overly blatant about this fact. It isn’t trying to feed off of any audience nostalgia, either. While some of the scares are genuine, the film does rely heavily on the scare tactics that make you jump. Pennywise is creepy at best, but, after all is said and done, he’s not an immensely formidable foe. Thankfully, the film grounds itself in friendships that are fairly well-developed and genuine in order to get by. Pennywise is creepy at best, but, after all is said and done, he's not an immensely formidable foe. Thankfully, 'It' grounds itself in friendships that are fairly well-developed and genuine in order to get by.